I ain't a drinker nor my husband. These wines were some of the left overs during our wedding reception. 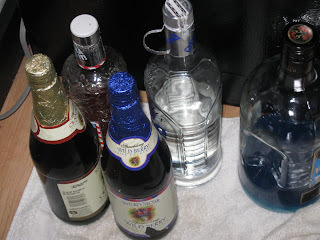 Since it was not all knock up we decided to bring some which is non-alcoholic home. I know, I know I am pregnant and YES I don't drink any alcoholic beverage. My husband might be if there will be some occasion. Would you like to have some toast? Since both of you don't drink alcohol, can we just have all of it then? Haha~ just kidding. But those wines look really delicious, huh?